7/3/2008Share this story on Facebook! This is your myIthaca home page. When you sign up for myIthaca, you'll receive a free print subscription to Fuse -- plus free and unlimited access to Ithaca's online college planning guide. Everyone wants it all from their college: a perfect blend of student life and academics along with real-world experience that will make you feel confident and ready to succeed. Of course, different colleges are right for different students. That's why I recommend signing up for myIthaca; it's a great website that will help guide you towards the college that’s right for you. Plus, it's free! I wish myIthaca had been around when I was looking for the perfect place: it gives you access to tips and information that will help you fine-tune your search, making it easy to find the school that’s the perfect fit for you. I remember searching for the right college: it’s a blur of long car rides and anti-climactic visits, looking through piles of brochures, stressing out about where to look, what to look for, and trying to figure out what I really wanted. I know looking for the right school can definitely be overwhelming, even when you have a rough idea of your dream school. If you’re like I was, you probably have a lot of questions about almost everything to do with the college looking/applying/deciding process. You're lucky, though, because myIthaca will guide you through every step of the way. MyIthaca gives you a lot of tools to make the process much easier than it was for me. 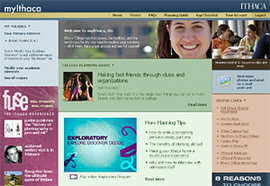 When you log in to myIthaca, you’ll get access to the College Planning Guide which is really helpful. This free online guide is jam-packed with tips to help your college search. There’s also a lot of information about the technical stuff, like what high school courses will build your resume and how to ace your applications. Also check out the financial aid glossary and learn about finding cash for college. College prep can be stressful and getting advice from parents or other students can leave you with more questions than answers. Should you take the SATs or the ACTs? Are your scores good enough or should you try one more time? myIthaca has strategies for test taking and the skinny on what colleges are really looking for, so you can focus your energy on the stuff that will really matter. By signing up for myIthaca, you’ll also get a free subscription to Fuse, the award-winning, print version of what you're reading right now. 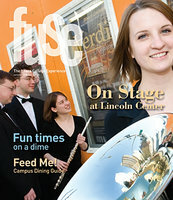 Fuse features stories about students, alumni and staff involved in the IC community. And, as you’d probably expect, myIthaca will also give you an inside look at the Ithaca experience. There’s information about IC’s living learning communities and other housing options. Students can also look through the huge range of majors that IC offers -- both the traditional and the unique. As you explore different majors, you'll also learn about the career opportunities that are available after graduation. MyIthaca is a great tool to have as you soldier through your search for the right school; answers to questions and much-needed information are right at your fingertips!